From 20 May to 26 August 2017, Galerie m Bochum is showing a 9-channel film installation by the German artist Melanie Manchot (b. 1966), who today lives in London. 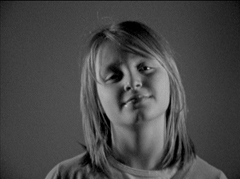 Back in 2008, Manchot began filming her daughter, then 11 years old, at regular intervals with a Super 8 camera. The project “11/18” ended when the girl turned 18. 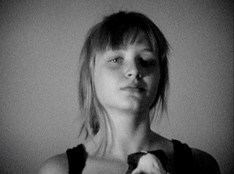 The resulting films document the girl’s progress from child to adult. In the artwork, nine CRT monitors positioned around the room show sequences shot during this seven-year process of development. 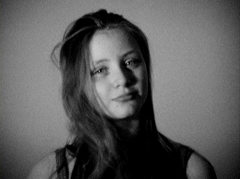 For the extraordinary film portrait “11/18,” Manchot filmed her daughter for one minute each month, always in the same head-and-shoulders view against a monochrome background and with identical lighting conditions. The static camera is directed frontally at the girl. 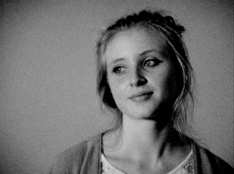 The artist chose to use black-and-white Super 8 film without a soundtrack, which has the effect of focusing all the attention on the sitter’s facial expressions and gestures. “11/18” harks back in some ways to Andy Warhol’s “Screen Tests” from the 1960s. In contrast to the American artist, however, Manchot has chosen to accompany a child throughout her years of puberty. The film sequences provide a vivid picture of this very special, physically and psychologically profound development phase. The metamorphosis is reflected at first in exterior elements: in changing facial features and hairstyles and in the way the girl dresses. But her gestures and facial expressions also undergo a process of transformation. Sometimes she looks away from the camera, and at other times flirts with it, running her fingers through her hair, looking bored, or grimacing a bit and implying dance-like movements. In some film sequences the subject looks out at us shyly and in others she exudes self-confidence. The impression she makes constantly alternates between evident efforts at targeted self-expression as opposed to authentic, more sensitive moments. On variously sized CRT monitors scattered throughout the space, film sequences are alternately switched on and off. Manchot thus gives the flow of images a rhythm, creating a composition made up of film, object and space. A film portrait that was developed linearly is thus presented in the installation in excerpts, and from constantly changing perspectives. The choice of the antiquated-looking television and video monitors and of Super 8 film with its specific aesthetic establishes a link to popular culture, creating a feeling of intimacy and shared collective experience. Manchot paints in “11/18” a poignant and sensitively evoked portrait of a young person progressing from the carefree playfulness of a child to the earnestness of a young adult.